We have now used Sonlight curriculum for a full year and have thoroughly enjoyed it! I wish it didn’t take me so long to make the switch to Sonlight, but homeschooling is a journey full of learning for us moms too! 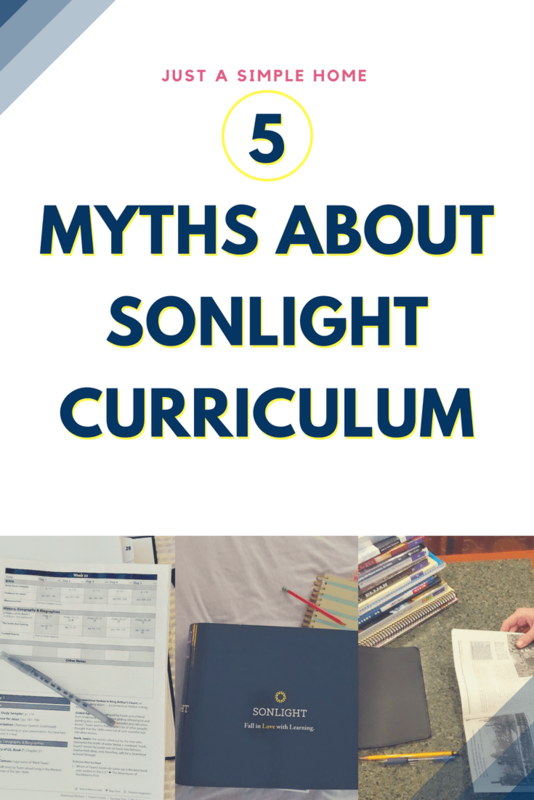 Before I started using Sonlight, I know I had heard so many myths about Sonlight curriculum and they were a bit off putting. So, today I am sharing those myths with you and giving you my opinion on them! Sonlight graciously gifted me a full level curriculum in exchange for my honest review. Sonlight is too expensive. I think this is the biggest myth out there regarding Sonlight curriculum. In full disclosure, before I truly researched, I thought the same thing. I looked at the package prices for the levels I wanted and had sticker shock! I wasn’t sure how we could afford that, especially being a one income family. Unfortunately, at that time I was only thinking of the price tag…not the value and practicality of it. In reality, the cost of using Sonlight is really nothing…especially if you have more than one child! When you break down the cost, it adds up to the cost of a sport or activity per child, per year. I know that after my oldest child uses a level, I will have 6 more students who can use that level eventually. Break that cost up over those years and it is unbelievably cost effective! Many of the books included in the curriculum would also be books that I purchased anyway, for my children to read for entertainment. Sonlight also offers payment plans to make it easier on families. Sonlight is too time intensive. I can assure you, if this was true, I wouldn’t be using Sonlight. I have 7 children, I run an online business in addition to this blog, my family is busy. I truly do not have time to sit down all day with each child using a curriculum that takes a lot of additional time. Sonlight has saved me so much time; it is pretty remarkable! The lesson plans are done for me, the research has been done for me, the Instructor Guide has all the notes I need for the year, along with review questions and answers, and more. You can read why we love Sonlight here, and it will explain how much time it has saved me. Sonlight is lacking in Language Arts. My son will be entering high school and I feel he is more than prepared. While it is true that Sonlight is light on the typical language arts program, it is anything but lacking! They provide vocab, spelling, grammar, reading, literature, writing…and more. You are free to use their suggested books, but if you don’t want to add anything (we didn’t), they provide all the tools you need for your study of language arts. In addition, the literature provides a wealth of knowledge for students! They have truly done a remarkable job in choosing literature for each level. My son’s vocabulary has expanded exponentially this year due to the amount of reading he has done. He is also gained so much confidence in his ability to write papers and do research. Sonlight can’t be used with large families. Why not? Sonlight’s levels span a pretty large age level. You can easily combine two or more students in a level. Core 100 can be used from 7th grade through 12th grade! Yes, you would expect less from your seventh grader and more from your high schooler, but you can easily use the same Core for both. You can use one Sonlight History / Bible / Literature program and one Sonlight Science program for all of your students, with skill-based subjects (Math and Language Arts) for each. If you have a big span of ages in your family, you may want to consider using 2 Cores for your school year. I have children ranging from 14 down to under a year old. Using 2 Sonlight Cores would work beautifully for us, as I can combine my older 2 students in one Core and my younger 3 in another Core. Sonlight doesn’t allow for flexibility. While it is true that Sonlight is a structured program, it does allow for plenty of flexibility. Since Sonlight is literature based it is simple to choose additional books and resources and add them to our schedule as we studied that particular time period. You are also encouraged, by Sonlight, to use the Instructor Guide as a guide. You do not have to read every book listed, and you can add in books as you wish! You also do not have to do everything listed in the teacher notes. There were many times that we took the 5 day schedule and made it into a 4 day schedule for the week, because that was the flexibility we needed. I love that Sonlight is structured enough, while being flexible enough to mold into your family dynamics. Sonlight may or may not be the right fit for your family. Or, it may be the right fit for some of your children and not for others. We know that our children are unique in their learning styles! If you are considering using Sonlight curriculum, these would be reasons your family should not use Sonlight. Otherwise, I encourage you to reach out to a Sonlight Advisor and they will be more than happy to walk you through your options. Give Sonlight a try for your next school year! As you can see, Sonlight is a wonderful fit for just about any family. 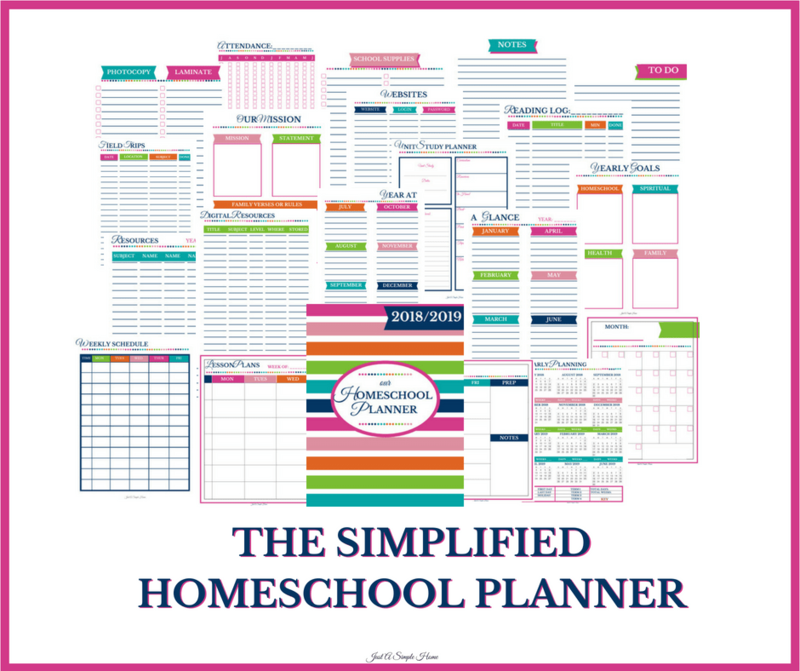 THE SIMPLIFIED HOMESCHOOL PLANNER IS ON SALE FOR A LIMITED TIME TO CELEBRATE THE START OF A NEW SCHOOL YEAR! Thanks, Dawne! That’s a great group!